Ginger has long been used in the culinary field to add flavor and spice to many a dish, but its roots also lie in medicinal uses. This herb can be used in many different forms including ginger essential oil, powder, dried herb, juice and fresh. Many people enjoy the health benefits of ginger tea as another method of getting all of ginger’s goodness. No matter how you choose to take advantage of ginger health benefits, it’s a tasty herb that can bring benefit to you in many ways. Check out this list of 10 amazing ginger health benefits that might have you adding a little more of this spice to your dishes, or enjoying a cup of ginger tea! Motion Sickness Miracle: Ginger for nausea is a well known natural remedy, but you may not know that this amazing herb can help remedy motion sickness! Muscle Soreness Maestro: Ginger benefits surprisingly are reported to include aid to sore muscles. Period Pain Partner: Perhaps its purported ranking amongst natural blood thinners is what makes ginger thought of as an aid for the discomfort associated with menstruation. 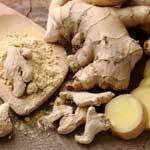 Cough Cure: Relief of bronchitis and coughing are thought to be ginger health benefits. Skin Solvent: Burns are painful, and ginger oil has been thought of as a relief agent for these painful external injuries. Blood Pressure Buddy: Some tests have shown that one of the amazing ginger health benefits you might not be aware of is its ability to reduce blood pressure. In fact, tests in animals concluded that there is a link between ginger and blood pressure. Gastrointestinal Goliath: Ginger isn’t just for treating nausea! If you’re rear end is working overtime, or you have flatulated enough to clear a room of people, ginger may be able to assist. Pain Police: Chest pain and back pain are both supposedly alleviated by ginger according to users. Appetite Agent: One interesting entry amongst purported ginger health benefits is its ability to stimulate appetite. Arthritis Assassin: Ginger has been used by people suffering from this chronic condition to relieve the aches and pains associated with it.